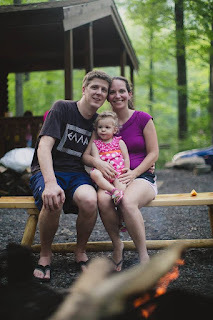 We had such a great time camping with our little 1 1/2 year old at poe valley state park. We decided to rent a cabin at about $35 a night. We stayed 3 nights. Four days was enough for us, our little girl, a cavalier king charles spaniel named Charlie. Chipmunks were everywhere in the camp ground. We loved watching them. Our little girl and Charlie did too. During the week we had some rain, but we had a camp fire every night. The reason we choose this Pennsyvania State camp ground was because you could rent a cabin and bring your dog. The state park also have a beautiful resivor with a beach. The beach area was beautiful on a sunny day. The beach was large. You could choose to sit on the grass in the shade or the sand. The area has nice new facilities. We invited some friends up for some sand play and a camp fire the first night. 12 of us enjoyed a camp fire, each others company, and good camp fire food (mostly mountain pies, smores, and oranges). The cabin did not have a stove or a refrigerator which I was upset about. The cabin did have a very nice front deck with a picnic table that I did enjoy. We had mountian pies one night, and hot dogs the next for dinner. This place sure makes me miss my kitchen at home. I think that what camping is all about. To get away from the internet, cell phone, and modern kitchen amenities and enjoy your family. Even though we did get some rain it was not too it was 70 in Pennsylvania in June. On June 10th 2013, a Monday, there was only 1 cabin and 2 campers here out of 50 camp sites all together. The sound of the waterfall over the spillway, crackling fire, and the birds is amazing.The smell and warmth of the fire makes me enjoy being in the woods. The chipmunks chasing for our food make me realize leave such a great impact on the wilderness in each place we stay. I am happy to have a sleepy toddler, a relaxed husband, and a tired dog as I write this. I feel very blessed to be in part of Gods beautiful creation. Sometimes I need to go an hour away from home to realize that. More pictures of Poe Valley State Park.